Southern University at Shreveport (SUS) is a two-year, state-supported, coed, community institution …. 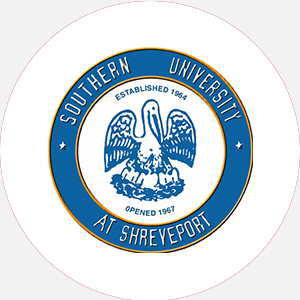 Southern University at Shreveport (SUS) is a two-year, state-supported, coed, community institution founded in 1964. SUS is a branch campus of Southern University and A&M College-Baton Rouge and part of the Southern University System, the only public black university system in the nation. As a branch of a land-grant institution, SUS is committed to providing education to students with diverse abilities and varying academic backgrounds. Its purpose is to prepare students for technical and semiprofessional careers. Through its liberal arts transfer program, students are prepared to continue their education at a four-year institution. The college consists of five buildings situated on 101 acres in a small town. Southern University at Shreveport is accredited by the Southern Association of Colleges and Schools (SACS) to award the Associate of Arts, Associate of Science, and Associate of Applied Science degrees. Percentage of students receiving financial aid: 95 Financial Aid Specific to the School The Air Force Reserve and National Guard offer financial assistance for active members who demonstrate financial need. July 1 (fall); November 1 (spring); April 1 (Summer). Graduation from an accredited high school (or equivalent); official high school transcript. A application fee is required ( for international students). Admission Application Deadline: July 1 (fall); November 1 (spring); April 1 (Summer). Admission Contact: Director of Admissions, Southern University at Shreveport, Bossier City Campus, Shreveport, Louisiana 71107; Telephone: 318-674-3342; 800-458-1472 (toll-free). A minimum of 62 semester hours and completion of core requirements. Campus Services: Health center, personal and psychological counseling, career planning and placement, remediation, and tutoring. Campus Activities: Social and cultural activities include chorale. Students may get involved in the student-run newspaper or yearbook. Leadership opportunities are found in the Student Government Association or the various other organizations, including religious organizations, fraternities, sororities, and honor societies. Housing Availability: None. Associate of Applied Sciences: Aviation Maintenance Management, Aviation Maintenance Technology, Dental Hygiene, Health Information Management, Invasive Cardiovascular Technology, Medical Laboratory Technician Studies, Physical Therapy Assistant Studies, Respiratory Therapy Associate of Arts: Art, English, Foreign Languages, Journalism, Legal Assistant Studies, Music, Speech, Substance Abuse Counseling, Theater Associate of Science: Biology, Chemistry, Computer Science, Criminal Justice, Surgical Technology Associate of General Sciences: Accounting, Biomedical Technician Studies, Biotechnology, Business Education, Business Management, Environmental Chemistry, Health Studies, Hospitality Industry, Political Science, Pre-engineering, Premedical/dental, Prenursing, Pre-Occupational Therapy, Prepharmacy, Pre-Veterinary Medicine, Psychology, Sociology, Technical Chemistry, Technical Physics Certificate: Airframe and Powerplant Maintenance, Computer-Aided Drafting, Diagnostic Medical Sonography, Electronic Technology, Phlebotomy.